The ESL legal conversation examples on this page will let you see how legal words are used in natural conversation. By studying them you will be better prepared for if you ever need to talk about this topic. This page starts with two full example conversations for you to read and understand. They have also been made into to two short cartoons that you can watch if you prefer to. If any of the words used pose a problem for you, you can look at the ESL legal vocabulary page to see their meanings. After the example ESL legal conversations there are 3 exercises for you to do. Have a conversation with your friend using the topics given. Situation: Lucy tells Andrew about being on a jury. Andrew: Hi. How are you? I haven’t seen you for a few days. Lucy: Hi. I’m fine. I’ve been busy. Andrew: What have you been doing? Lucy: I was called to do jury duty. Andrew: Wow. What was it like? Lucy: It was good. It did not take too long and was fun. Andrew: What happened? I have never been on a jury. Lucy: I got a letter telling me to go to the court house, and I was then taken to a court room. Andrew: What was the case about? Lucy: It was about a teenager who had done a lot of robberies? Andrew: You found him to be guilty? Lucy: Yes. It was easy. There was so much evidence that there was no doubt he did the crime. Andrew: Why did it take so long then? Lucy: There was just so much evidence. The evidence took three days to present and then we only needed fifteen minutes to reach our decision. Situation: Jane and Patrick witness a crime. 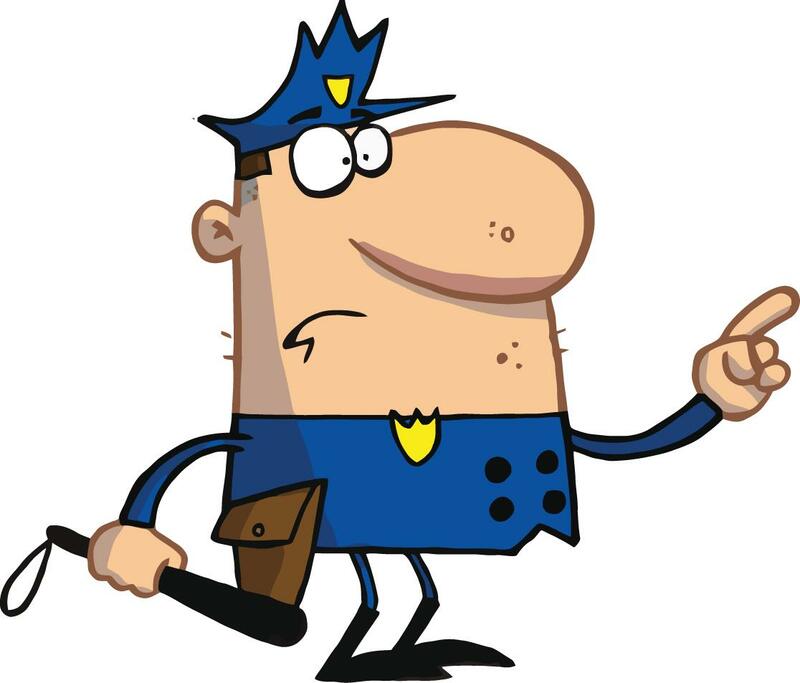 Police officer: Good afternoon. I need to take a statement from each of you about what you saw. Police officer: Please first tell me your names. Jane: I am Jane Major. Patrick: I am Patrick Luck. Police officer: Ok, now please tell me everything you saw. Patrick: We were walking along the street when we saw the car driving down the road quite fast. Jane: It was not going in a straight line. It was weaving all over the road. Patrick: It then hit another car that was parked at the side of the road. Jane: Then it hit the lamppost. Police office: Ok thank you. Is there anything else? Jane: Yes, we went to try to help the driver and saw several open beer cans in the car. Police office: Good. Yes the woman has been charged with drink driving. You might have to come to court to be witnesses and give evidence. Jane: Yes, we will be able to do that. 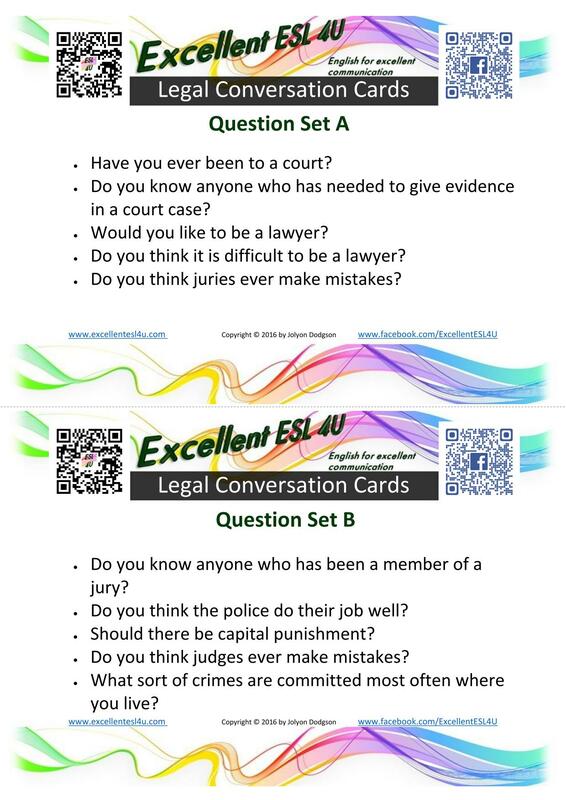 You can now do the following ESL legal conversation exercises as you have learnt the vocabulary and understood the example conversations. Doing the exercises will enhance your understanding even more. For the first ESL legal conversation exercise you need to choose the best option (A-D) to fill in each of the gaps in the following conversation. Once you have finished you can click the get score button to see how you did. Situation: Lucy, Jane and Bob discuss a report on the Internet about a court case. Lucy: Have you read about this court case? Lucy: It’s about a ___________1___________. Jane: Yes I heard about it a few days ago. It seems like the ___________2___________. Bob: Who is he alleged to have killed? Did he do it? Jane: His mother to get her money as he owed a lot of money to other people. Lucy: The trial is still happening. There is still more ___________3___________ to take the stand. Bob: So they don’t know if he did it yet? Jane: It seems likely that he did it. Most of the evidence is very strong. Jane: Yes I expect that he will be found guilty of the murder. Bob: If he did it I hope the judge gives him a very long prison sentence. Jane: Yes, so do I.
Lucy: We should still ___________5___________ who commit crimes like this. Bob: I’m not sure the death penalty is a good idea, but he defiantly should never be paroled out of prison. He should die there. Choose the best option (A-D) in the following five questions to fill in the blanks in the legal conversation given above. For this ESL legal conversation exercise you need to write your own conversation. It should be related to the legal vocabulary and be set in a situation where the vocabulary might need to be used. You will need to list the people having the conversation and the topic that the conversation is about. Then after that write what they would say to each other. If you have a friend, you could then try speaking the conversation out loud together. In this ESL legal conversation exercise there are two sets of 5 questions each. You should take one set and your friend should have the other set, then have a conversation using the topics. Remember to say as much as possible and ask any extra questions you can think of. Once you have finished you can switch questions and start again. Have you ever been to a court? Do you know anyone who has needed to give evidence in a court case? Do you think it is difficult to be a lawyer? Do you think juries ever make mistakes? Do you know anyone who has been a member of a jury? Do you think the police do their job well? Should there be capital punishment? Do you think judges ever make mistakes? What sort of crimes are committed most often where you live?